322 in stock Need More ? 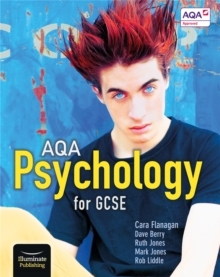 Written by renowned author Cara Flanagan and a highly experienced author team, this Student Book has been approved by AQA, offering high quality support you can trust. // Each topic in the specification is presented on one spread so you can see the whole topic with just the right amount of detail and depth of information. // Spreads are divided into Description (AO1) and Evaluation (AO3) - the two key skills for any topic. // Research methods and mathematical requirements are thoroughly covered in a dedicated chapter plus in 'Apply it' exercises across the book. // Application questions, practice questions and skills guidance are provided for the new assessment objectives and mark schemes. // Each chapter ends with visual summaries, example student answers with comments and test yourself multiple choice questions.